In October 2017, I traveled to London, Greece and Egypt. Aside from my excitement at seeing a location I’ve never before visited (Egypt), I also knew I would come to meet some soul aspects. I just didn’t know how many. Soul aspects are people who lived in another time frame (sometimes one or more may be alive in your current time frame) and are you in another life. An aspect is you in a past or future lifetime. They may or may not look like your current form and may or may not be the same gender as you. They have experienced their own life, which means they may have experienced trauma, abuse, love, joy, adventure, loss or anything else. Some people have memories and/or dreams of other lifetimes. Our minds retain the experiences and then transfer to our brains. We can experience many issues in this life as a result of what we experienced in a past life, thus meeting and assisting a soul aspect who still holds onto their past issues can be quite beneficial. 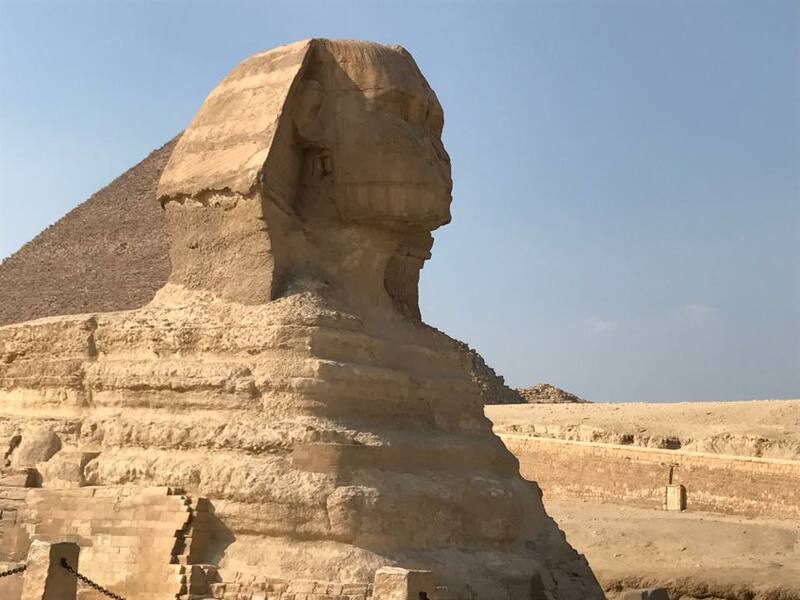 Prior to arriving in Egypt, I was advised to meditate in front of the Sphinx and to look to my left, right, and slightly behind. Though the area in front the Sphinx was quite busy with tourists, I was able to focus and feel. In looking in all three directions, I saw a total of six aspects. Little did I know at the time, one of them would be very difficult to work with. Since I had, and still have, no memory of saying this nor to whom I could have been saying it, I simply let the information sit and returned home. Approximately a week later (having temporarily forgotten what my friend said), my husband, Robert, shared that I said the same thing, also in a frightened manner. Now I was intrigued. My first thought was maybe I was saying this to my aspect, but at least from a higher mind perspective I do know all my aspects and history. So that didn’t make sense. Later, I was assisted in understanding. One of my aspects had a cord. A cord is an energetic attachment that will have a negative intent. The intent is to control something or someone. Many physical people have attachments/cords that can convince a person to act on many painful thoughts. This can be substance abuse, self-harm, harming others, and/or suicide. The results of a cord can also be depression, anger, denial, and many other painful responses. A cord comes from another person (physical person or a nonphysical/ghost person). The person doing the cording (attachment) is trying to control something. The person who is corded may feel they have little power over their emotions and reality. Not everyone who is depressed, angry or suicidal has a cord, but many do. With assistance, I understood the person cording my aspect was coming to me to try and pretend HE was my aspect. From a higher mind perspective, I knew the cord was only trying to manipulate and I was resisting him. With my guides’ assistance, I saw that my true aspect has blonde short hair. Later I was also told he lived in the 1400’s in London. This explained why my first trip to London, in October, meant so much to me. I absolutely love London. More than once, Robert told me I was yelling at someone in my sleep. I never have memory of talking in my sleep, but I can probably assume it was connected to the cord. It was time for me to begin working with this pained aspect, to help him heal in order to let the cord detach from his energy. A physical person, who is corded, would most benefit from a Life Energy Flow Tai Yi treatment to remove the cord. Even nonphysical ones can have a cord removed by another who knows how to do it. I came to realize my aspect simply didn’t want his cord removed. In my first meditation, I went to him so we could talk. He was already there waiting for me. As I spoke with him, generally offering my assistance, I took his hand. I could feel warmth in my physical hand as I touched his in the meditation. He did not seem willing to accept my assistance but did not immediately walk away. In ending the meditation, I promised to return. Procrastination became a theme in working with my aspect. So many times I would find something ‘more important’ to do instead of working with him. I knew I would need to move past this resistance. Two weeks later, I went into a meditation to visit with him again. “I was told not to trust you,” he said. “Of course you can trust me, we are of the same soul,” I said. He didn’t look convinced, but he did show me an image. In the image, he was shaking a woman by the shoulders and telling her she needed to admit guilt to someone. The feeling he offered me was that he was convincing her to admit guilt to something she didn’t do, but would allow him to avoid punishment. She did admit guilt and was punished. He then carried guilt for doing this. “You have to forgive yourself,” I said, after he showed me the image. He turned and walked away leaving me there with no idea what to do. Later I was advised that if he does that again, to place myself in front of him instead of allowing him to leave. If he turns to leave again, to move again in front of him. A few days later, I returned to him. I implored the need to forgive himself. His energy seemed slightly better, but I knew I had much work ahead of me. A week later, I decided to call him to me instead of going into meditation. I called him just like I would any nonphysical person. I waited a few minutes and then felt him arrive. He seemed better, but I was cautious since I knew the cord had a lot of power behind it and can manipulate. I, again, expressed love, patience, and kindness to him. I advised him to forgive himself and that it’s ok to heal. He didn’t say much but seemed to listen to at least part of what I said. Soon after that I received a Life Energy Flow Tai Yi treatment. This particular treatment is designed to assist pained aspects. As a physical person, I would receive the treatment, but the energy was more for the pained aspects to assist them. My focus, my desire, my hope was for the treatment to help my London aspect release the cord that was attached. It seemed with every meeting with him, he took in little bits of information, but ultimately the cord seemed to have the control. I gave the treatment time to assist him before I tried to speak with him again. In the meantime, I had a dream in which I was being restrained by two humans and tried to fight it. A few days later, I called him to me again. “What caused your fear? What were you so afraid of?” I asked. He did not say anything and simply left. I had doubt that his cord was removed, but I wanted to hope. A few weeks later, I went back into meditation to the aspect instead of calling him to me. I could see from his lack of progress that nothing changed and his cord was still influencing him. “I don’t want to talk with you,” he said and started walking away. I jumped in front of him. He turned and I jumped in front of him again. We stood staring at each other for a moment, but I didn’t know what to say anymore. I felt confused and defeated. What was I to do with this? I felt like I was hitting my head against a brick wall with nothing to show for it. I felt like nothing productive was happening. Soul Aspects Part II coming soon! This was very helpful! Not only was it interesting, but also helps me to understand several different things. I don’t know if you are interested, but in case you are, these are some of the understandings. 1) Other people, even advanced people like yourself, still experience these different negative feelings of resistance and so on. 2) This means that it does not mean I am failing to make progress if I have these experiences. 3) Other aspects can be corded or being influenced (and probably are) and this can be causing negative emotions, also. 4) There are ways to connect with other aspects. 5) Its possible to assist other aspects by interacting with them. Thank you so much for your posts about your process with your Soul Aspect with the Cord. A wealth of assistance for everyone. Plus I appreciate your Meditation process. I am trying to get a handle or to even understand something Jonah said, at this past Friday’s Jonah Group. I don’t actually have a copy of exactly what or how, Jonah imparted to one of the attendee’s…. the Jonah Group, as part of their conversation with Jonah. So far that’s all I was told. Any suggestions you have, as to how to wrap my head around this would be appreciated. Yes, it is very possible to be an aspect of someone in the physical and even one you’ve known for a while. I will email you.